Quinta do Barão is the maker of this Quinta do Barão Carcavelos Last Reserva Dry ($76.64), a white wine from the region of Carcavelos with trincadeira, negra mole, galego dourado and espadeiro grapes and shows an alcoholic content of 19%. According to Uvinum users, this white wine earns 4 out of 5 points. - Nose: Very smooth, light nuts. - Mouth: dry and elegant mouth, a long, smooth finish. GRAPES: Trincadeira, Galego Dourado, Espadeiro, Negra Mole. PAIRING: as an aperitif or with dessert. 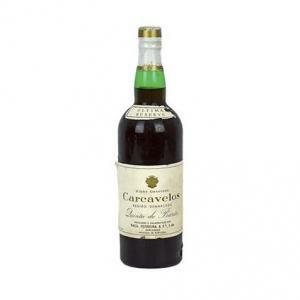 Very old, fortified wine presents an unobtrusive but very fine aroma, different from all the other generous. Very gentle, slight dried fruit, dry mouth and elegant but with a long, soft finish. If you want to buy Quinta do Barão Carcavelos Last Reserva Dry, at Uvinum you will find the best prices for Carcavelos white wine. Buy it right now at Uvinum, quick and 100% safe via any device. We offer your over 59.000 products for sale becoming this way the biggest company to sell wine, beer, and spirits online in Europe with a community of more than 38.000 customers who enjoy Uvinum.